In Crash's latest adventure, the villainous Cortex has teamed up with N.Brio and created a monstrous mind controlling device that has taken over all the bandicoots and mutants on Wumpa Island. 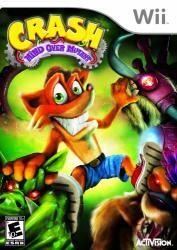 Crash sets out to stop the madness by destroying Cortex's evil device using his quick wits, lightening agility, and the hijacked mutant in his pocket! Not only does Crash gain the ability to control his enemies when he jacks them, now he can store his favorite monsters in his pocket, upgrade them and utilize their powers when they are most advantageous.